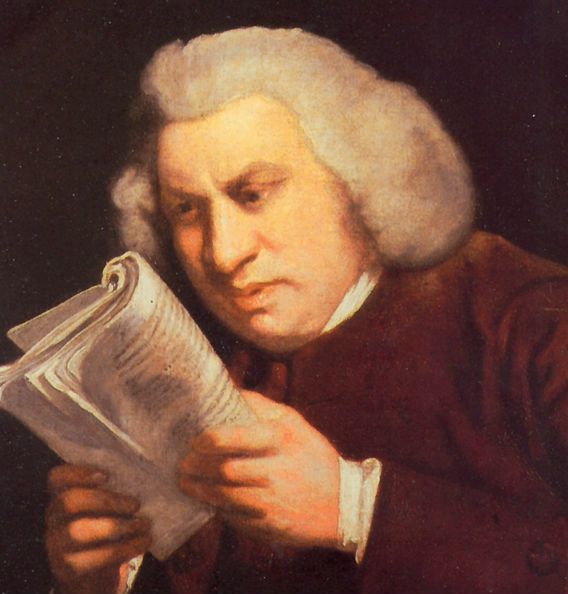 Dr. Johnson was 41 in March of 1751 and several years into his work on his most lasting project, his Dictionary. Unlike most of the dictionaries developed for any language, and all dictionaries in English, Johnson’s “A Dictionary of the English Language” was written by one man. An entire dictionary, with more than 40,000 word entries and over 100,000 literary quotations to back up and explain Johnson’s definitions and create an etymology (the study of the origin of words). It took Johnson nine years to complete it; 75 years later, Noah Webster published his own dictionary, which had 70,000 entries, took 25 years to complete, and cites Johnson throughout. The first completed edition of the Oxford English Dictionary took 75 years and dozens of scholars to compile its first edition, published in 1928. Johnson offers a quote from English literature, usually the King James Bible, Shakespeare, Milton, Swift, or Dryden, as a pertinent example for each particular definition. Sometimes he offers as many as seven quotes. For his fourteen definitions of “Time,” he uses forty-six quotes. This project would be difficult enough to produce in our era of desktop publishing (is there an app for dictionary creation? ); Johnson put together his Dictionary in his house, with workmen appearing every so often to assemble a printing press and run off some pages. He paid them out of his own pocket. His personal library, large but not comprehensive, was supplemented by books borrowed from friends. The books were so covered with his markings that they were not worth being returned, the friends remembered. It took him nine years to complete the Dictionary, yet he had promised it in three. For the rest of his career, Johnson was ridiculed as a slow worker; he proposed to work up an edition of Shakespeare’s plays (the first ever single source, authoritative edition that would be created) in 1756 and started attracting subscribers, but by 1762 another writer took a public jibe at him: “He for subscribers baits his hook/and takes your cash, but where’s the book?” His Shakespeare was published in 1765. While working on his Dictionary, he published a self-written, twice-weekly periodical, The Rambler, to earn a living. (In other words, he wrote a blog while working on his big project.) Then, while working on his edition of Shakespeare, he published a weekly blog, um, magazine, called The Idler. Johnson had many health issues, ranging from regular bouts with a bleak depression, which he was the first to name the “black dog”; nearsightedness that glasses did not aid (or vanity made him avoid them); a disfiguring skin condition; and Tourette syndrome, a condition that did not have a name until the late 1800s and was not considered a medical condition in Johnson’s lifetime. The tics made him seem an odd character, and he felt he had to win people over with his wit. (Asked once why he made noises, he said it was a bad habit.) His many tics and violent gesticulations are described in every contemporary account about him written by his friends, so the posthumous diagnosis seems a trustworthy one. The black dog I hope always to resist, and in time to drive, though I am deprived of almost all those that used to help me. … When I rise my breakfast is solitary, the black dog waits to share it, from breakfast to dinner he continues barking, […] After dinner, what remains but to count the clock, and hope for that sleep which I can scarce expect. Night comes at last, and some hours of restlessness and confusion bring me again to a day of solitude. What shall exclude the black dog from an habitation like this? This first appeared in November 2014. Today in History: Happy Birthday, Jen!